This website has been designed to provide information and insight for you before and during your CAMINO. There are myriads of guidebooks and online resouces to help you plan your CAMINO, but I'm of the opinion that you should do the minimum of planning possible. A basic route guidebook is really all you need, so you can figure out what pace you'll have to set and what sights you want to capture. Once you're on the way, you'll find your plan changes. You'll meet people you want to walk with for a few days or all the way; you'll want to push yourself to do another few kilometres; you'll decide it's a perfect time to sit by the river and cool your weary feet or even join a group having a picnic stop before continuing. On the French Route of the Camino De Santiago, there's enough infrastucture around that you don't need to have every detail noted down. 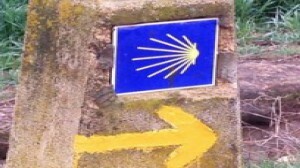 is the Camino de Santiago ? This video can only be viewed on a bigger screen. Adjust screen width. Just in case! One never knows. The entire Camino Francés takes around 31 days to complete, but the total length of time you’ll take depends on how fast you walk. You can also choose to start from any point on the Camino — it’s all up to you. To get the Compostela at the end of the Camino, you just need to walk a minimum of 100km (many people start in Sarria for that reason). Most people walk around 24-28 kms. ( 15-17½ miles ) a day, waking up as early as 6am and walking all the way to late afternoon. Again you should decide your own pace and not try to follow the crowd. The Compostela is an oficial certificate issued by the Pilgrim's Office upon completion. 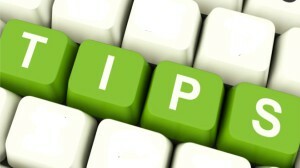 You need to have made the pilgrimage for religious reasons or for a similar motivation such as a vow. You need to have walked or travelled on horseback at least the last 100kms, or cycled the last 200kms, to arrive at the Cathedral of Santiago de Compostela. You should collect at least two sellos (stamps) each day on your credencial. This will usually be where you sleep and one other place such as a Church, Town Hall, café, etc. You must ensure that you do this at least in the last 100 kms from the Cathedral of Santiago if you are walking or on horseback and 200 kms if you are travelling by bicycle. Where can I obtain the Credencial? It is available by applying in person from the Pilgrims’ Office in Santiago or from other organisations authorised to distribute the official Credencial, such as Churches, Amigos groups, albergues etc. 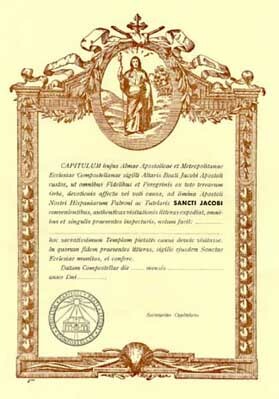 In some countries other than Spain voluntary organisations such as Confraternities who support the pilgrimage to Santiago have been permitted to supply their own Credencial. Please note that ONLY the credencial issued by the Cathedral of Santiago through the Pilgrims’ Office, or by an organisation specifically authorised, will be accepted. The Credencial bestows no rights on the pilgrim. It has two practical purposes: admission to albergues ( both, public and those run by Christian associations ) along the way; and to obtain the Compostela from the Cathedral in Santiago which certifies the pilgrimage has been completed. Where can I get 2 sellos ( stamps ) per day? Sellos are available in many places along the routes particularly in the last 100kms. Sellos are available in Churches, albergues, hostales, ayuntamientos (town halls) and many other places, including cafeterias, restaurants and the local police stations. REMEMBER : The albergue stamp where you spend the night is a MUST. When is the Pilgrims’ Office open? 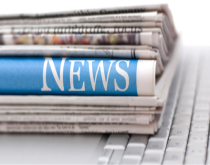 Monday to Sunday 8.00 – 21.00 (In summer: from Easter Monday to 31 October). Monday to Sunday 10.00 – 19.00 (In winter: from 1 November to Easter Sunday). The Pilgrims’ Office is open during these hours every day of the year with the EXCEPTION of Christmas Day – 25 December, and New Year’s Day – 1 January. If you happen to complete your pilgrimage on these days your Compostela can be obtained in the Cathedral. What are the Mass times in the Cathedral? Will I get to see the Botafumeiro? The Botafumeiro is NOT used at every Pilgrims’ Mass in the Cathedral. It is used on Feast Days and when groups specially arrange for it. Anyone here speaks English? ¿Hay alguien que habla inglés? What does [....] mean? ¿Que significa [...]? Where is (are) ...? ¿Dónde está (estan) ... ? Where is the nearest albergue / hotel? ¿Dónde esta el albergue/hotel más cerca? Do you have any beds available? ¿Hay camas? How much is ....? ¿Cuánto cuesta ...? Could you help me please? ¿Puede ayudarme, por favor? My name is Vincent Hussein. 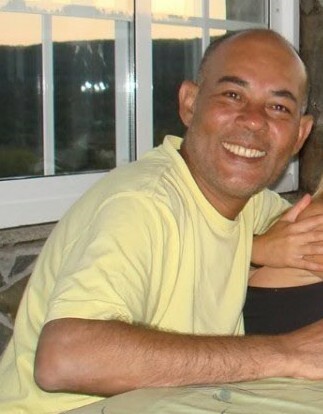 I was born and bred in Tanzania, emigrated to England with my mother and 6 siblings and finally settled in Spain, thanks to a wonderful Spanish girl I met in London I madly fell in love with who eventually became my wife and the mother of our three wonderful girls. Destiny decided that we should just be friends but not a couple anymore. I then met a wonderful lady, Helena, who filled the vacuum in my heart after my separation, and we decided to form a family. We have a son together who is now in his twenties. Having lived in Spain since Dec. 1982, it was only after watching a documentary on TV about the Camino de Santiago in Aug. 2010 that I made one of the best decisions in my life so far. One week later, after some quick acquisitions of hiking gear ( I had never hiked before ), I was on my way. My first CAMINO was from Sarria, the minimum one needs to do to achieve the COMPOSTELA. I have never stopped since then, extending my CAMINO every year along the FRENCH ROUTE. This site is my little contribution to those wishing to do the CAMINO FRANCES ( the French Route ) and will keep growing. I need your generous support. 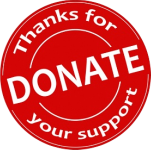 A small donation will help towards maintaining the site and keep providing useful information. Many thanks for visiting and your support. More Popular than Ever, Way of St. James Still Offers Enlightenment. Not long ago, only a few people would make the pilgrimage to Santiago de Compostela in Spain. Now, over 200,000 people a year spend several grueling weeks along the route. Walk of a lifetime: Why the epic Camino trail across Spain is a route to true happiness. You will have heard about life-changing journeys, but if I describe a 500-mile walk to Santiago de Compostela, I suspect your reaction would be: turn the page. Pilgrim Julia walks the 500-mile Way Of St James. Julia Roberts, an Anglican from West Staffordshire, says pilgrims seek God not just by completing the walk but through contemplation while en route. She describes her experience of it as a way of trial, challenge and fulfilment. What is the Camino de Santiago ? The Camino de Santiago, also known by the English names Way of St. James or St. James's Way, is the name of any of the pilgrimage routes (the most popular being the Camino Francés or French route) to the shrine of the apostle St. James the Great in the Cathedral of Santiago de Compostela in Galicia in northwestern Spain, where tradition has it that the remains of the saint are buried. The Way of St. James was one of the most important Christian pilgrimages during the Middle Ages, together with those to Rome and Jerusalem, and a pilgrimage route on which a plenary indulgence could be earned. Legend holds that St. James's remains were carried by boat from Jerusalem to northern Spain, where he was buried on what is now the city of Santiago de Compostela. Nowadays, tens of thousands walk or cycle the Camino de Santiago every year in an epic journey of 500 miles. People from all over the world with all kinds of motivations: sport, culture, religion, nature, adventure, fund-raising, etc., walk or cycle El Camino de Santiago, or parts of it, as a lifetime experience. Many return to re-do, re start from where they left off or discover one of the other routes. 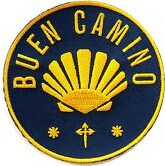 El Camino de Santiago has been declared World Heritage by UNESCO and the First European Cultural Itinerary. Whenever St. James's Day (25 July) falls on a Sunday, the cathedral declares a Holy or Jubilee Year. Depending on leap years, Holy Years occur in 5, 6, and 11 year intervals. These are the busiest years. The most recent were 1999, 2004, and 2010. The next will be 2021, 2027, and 2032. All routes on the Camino are well-signposted with yellow arrows, so all you need to do is just follow the arrows and they’ll lead you the right way. Sometimes things can get a little confusing in cities, but just make sure you don’t walk too far without seeing an arrow. distances shown are approximate The stages shown on the map are where pilgrims usually start and end, but one can stop and start anywhere in between where amenities are available. "walk the way, your way"
Trains ( RENFE ) and Buses ( ALSA ) to Santiago, Lugo, León, Burgos, Logroño, Pamplona. Taxis are available from Pamplona to both Roncesvalles and Saint-Jean-Pied-De-Port, but are quite expensive. It's probably wise to share a taxi ride with other pilgrims and share the cost. The weather in Autumn (Fall) and Winter can be very harsh in northern Spain. People do walk the Camino in these periods, but only the very brave and adventurous. The Pyrenees can be very dangerous in late Autumn and Winter - blizzards, snow and very heavy fog making it difficult to follow the signs. Many have got lost, and due to the weather conditions, rescue operations can be difficult. Besides, bear in mind that many ALBERGUES close during these periods. I would not make the choice to walk at this time of the year, however many don’t have a choice due to time constraints. SAFETY FIRST. The best times weather-wise are Spring ( April, May and June ) and the Summer ( July, August and September ), but July and August are too hot and busy (Yes, it does get very busy). I do my Camino in September simply because it is when I am free and luckily it's not as hot and busy as in July and August. There are many different types of accommodation along the Camino de Santiago, ranging from hostels (albergues) to guest houses, hotels and luxurious paradores. 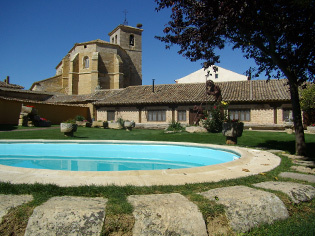 There is a good network of albergues (hostels) along the the French Way or Camino Frances. The classic Camino albergues are public, either run by ‘hospitaleros’ (Camino volunteers) or the region's autonomous governments, BUT they can’t be booked in advance. 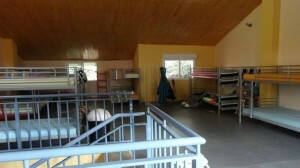 Beds and bunkbeds in dorms are allocated on a first come first served basis. You will need to have your pilgrim's passport (credencial) stamped, as part of the ‘check in’ process and walking pilgrims always have priority over other pilgrims (i.e. on horse back or bike pilgrims). In some bigger towns and villages, you will also find privately-run albergues with a similar set up: beds in dorms and rooms at low prices that can be reserved before-hand. This is a good option if you are planning to stop and visit places, take pictures, attend pilgrim masses on the way or just don't want to rush. Guest houses can be called ‘pensiones’ or ‘hostales' and they are small family-run businesses. They might not have a star rating but they are a good accommodation option where you will have your own room, bathroom and usually have a bar/restaurant. They are slightly more expensive and rooms can be reserved. There are hotels ranging from 3 to 5 stars all along the Camino Frances in the bigger towns and cities. A parador is a kind of luxury hotel, usually located in a historic building. Parar means to stop, halt or stay. A profitable state-run enterprise, the hotels are often in castles, palaces, fortresses, convents, monasteries and other historic buildings. The Hostal de los Reyes Catolicos in Santiago de Compostela is considered to be one of the oldest continuously operating hotels in the world, and one of the finest Spanish Paradors. Prices usually vary according to room, region and season. Getting the packing right for the Camino will make it much more enjoyable. The following packing list only contains the essentials and leaves the rest to you – the lighter you travel, the more enjoyable your walking. Small plastic bags to carry your rubbish with you until you reach a bin. Keep the Camino clean. Needle and thread – when you get a blister this will help. Thread the needle and run through the blister, leave a bit of thread inside to drain the blister. BLISTERS - Don't remove the skin. This is very important, the skin covering the blister is a natural defense against infections and abrasions, leave until it falls off by itself. With your backpack filled you are aiming for 10% of your body weight. Less is better. Not everyone has 4- 5 weeks needed to complete the French Route of the Camino de Santiago. One can start from any point and end anywhere. Many people do it in 4 separate weeks, starting off from where they stopped. 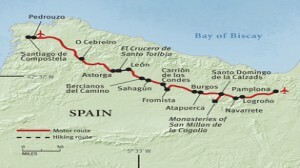 To receive the COMPOSTELA one will have to walk a minimum of 100 kms and end in Santiago. To do this, your starting point will be Sarria which is 111 kms. from Santiago ( 5 walking days ). This is where 50% start their Camino, especially in the busy summer months. This is what I did on my first Camino in 2010, and I have never stopped since then. Whether it is an albergue, hotel or something in between, one thing is for sure, you have a lot of choices for accommodations all along the French Route. While I encourage you not to plan too much and just let your journey happen spontaneously, here is a list of places not to miss. This place is an amazing oasis in the middle of nowhere. Crappy looking on the outside, but as soon as you cross the gates you are greeted by wonderfully manicured gardens, green lawns and a swimming pool. The owners are incredibly friendly and the entire place is very well run, clean and hot showers. They offer a well priced communal meal every evening and have a great patio where you can rest your tired out feet. Run by a young couple, Livia and Unai, who met on the Camino. 32 beds (dormitory and private rooms), with all amenities. Laundered bedsheets and pillowcases everyday (a luxury). All this from just €8. River opposite the albergue. Picturesque area. Self-serve eat as much as you can breakfast to start your day for €2. For me this was one of the best albergues I stayed in on the French way and especially about the treatment we got. Lola, the hospitalero, a wonderful and helpful lady. Clean albergue with a bar, outdoor terrace and indoor lounge with a small library and TV. Highly recommended communal pilgrim dinner is organized in a restaurant behind the albergue in a palloza (traditional dwelling). 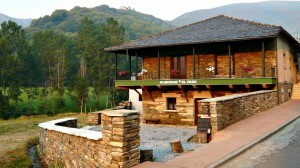 Probably the best public albergue along the French Route in Galicia. Worth stopping 3 kms. before Arzua and doing those 3 kms. the next day after a wonderful night's rest. Separate building housing toilets, showers, washing and drying machines. 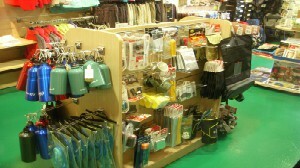 A well equipped kitchen where one can prepare meals. Green lawns and a river to cool your feet. There's a big restaurant/cafeteria/bar adjacent with a big terrace. It goes without saying that walking all day, mile after mile, the Camino not only makes you hungry but allows you to eat whatever you want. No diets here. 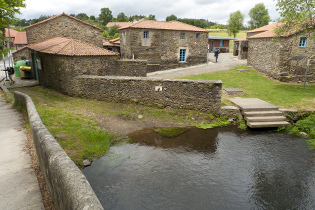 With an abundance of small inns along the way, pilgrims walking the French Route of the Camino de Santiago have enjoyed the local food and wine for years. Every town on the Camino has a variety of lively plazas with bars and restaurants, so there will be plenty of opportunities for you to enjoy the delicious Spanish gastronomy and the variety of world-famous Spanish wines. In my opinion this is the most delicious cured meat on planet earth. Unique to Spain and made from pigs that roam through oak forests and eat acorns, herbs and grass which imparts a flavor all it’s own. 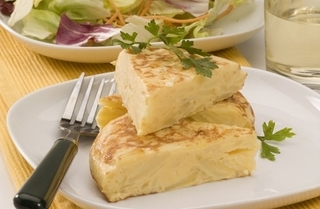 Spanish omelette is the English name for a typical Spanish dish called tortilla española or tortilla de patatas, consisting of an omelette made with eggs and potato and either with or without onions, cooked in oil. Ideal at any time of the day. Navarre has developed a light, rich, elegant cuisine, based on the fruits of the land, and particularly on its vegetable farms, among which the white asparagus and Piquillo peppers are outstanding. Menestra (vegetable stew) is the most renowned of the typical vegetable dishes of the region. Other classic dishes include haricot beans from Sangüesa, lamb chilindrón from Pamplona and roast finch from Estella. Among its fish dishes, salmon from the Bidasoa River has become increasingly popular. Delicatessen duck preserves from the Aranaz district enjoy well-deserved prestige, while the cherries from Ciriza or preserved peaches and pears make an ideal dessert. The best-known wines of Navarre are the rosés, although excellent whites and reds are also produced, all under a designation of origin. Pacharán, a liqueur made with sloe berries and anisette, has become a symbol of Navarre. The simplicity and quality of Riojan gastronomy has its origin in the outstanding produce of the land: lettuces, peppers, onions, artichokes, borrages, asparagus, beans and peas.peppers. A typical dish is pochas or caparrones, beans not fully dried, with the marvelous flavour of the pork sausage (chorizo) or quails with which they are cooked. Another of the typical dishes of this region are patatas a la riojana, a simple potato stew with chorizo and dried red peppers. Its most notable pork products are sweet morcilla (black sausage) and chorizo. Lamb cutlets cooked over dried vine shoots are the region's most typical meat dish. Although it is not a coastal region, the Riojans have created dishes like Rioja-style cod in tomatoes and peppers, and freshwater fish such as trout and crayfish form part of its traditional repertoire of recipes. But it is undoubtedly Rioja wine that has brought worldwide fame to these lands. The gastronomy of Castile is based on contrasts, smoothly blending the diversity of the gastronomic legacy from Jews, Muslims and Christians. The large amounts of legumes produced in the region have made chickpea stews typical, as well as meat stews. The cocido maragato (a chickpea stew from the province of León), is outstanding for the excellent balance of its ingredients and preparation. 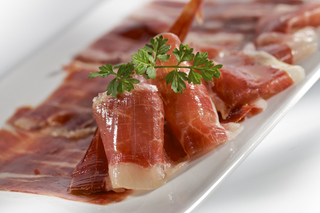 Pork and lamb are the staple Castilian meats, which range from roast lamb and suckling pig to a wide variety of cured meats: Iberian hams such as those from PDO Guijuelo, chorizos (pork sausage) from Villarcayo, morcilla de Burgos (black sausage), PGI Cecina de León (smoked beef), or PGI Botillo del Bierzo (a sausage type cured meat product). Mention must be made here of one of the region's best-known cheeses, PDO Queso Zamorano, made from Castilian ewes' milk. Trout fished in the rivers of Zamora and León is widely appreciated for its extraordinary flavour. Galicia, land of emigrants, is the land of gastronomic festivals that celebrate the abundance from the region’s sea and vegetable farms. The Galician ecosystem is plentiful in seafood of exceptional quality: percebes (goose barnacles), cigalas (Norway lobsters), vieiras(scallops), centollos (spider crab), nécoras (swim crab), bueyes de mar (large crabs), prawns... The pulpo a feria octopus (market fair tradition) with potatoes, olive oil and pimentón, a type of Spanish paprika) is one of the typical dishes in this region. Galician veal is exquisite either alone or when added to Galician stew made with potatoes and chickpeas or a typical beef stew called carne ó caldeiro. Roast kid (baby goat) is also typical, and the quality of the farm chickens, fed carefully with natural foods, is widely appreciated. Lacón (baked pork shoulder) is traditionally eaten in Galicia with grelos (turnip greens). The majority of Galician cheeses are made from cow's milk. 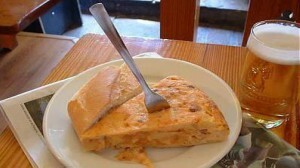 Some the best known of these are PDO Queso Tetilla, PDO Arzúa-Ulloa, PDO San Simón da Costa and PDO Cebreiro. Among the produce cultivated widely in Galicia's vegetable gardens are pimientos de Padrón (green Padrón peppers), potatoes from Bergantiños and turnip greens. Caldo Gallego (Galician broth) is made with white beans, cabbage or turnip greens, potatoes and lacón (cooked ham). Galicia has made the empanada a genuine delicacy. These savoury pastries or pies come with many fillings and shapes, the most popular ones are filled with seafood or fish - Cod (bacalao/bacallao), mussels (mejillones/mexillóns) and tuna (bonito). The Designations of Origin in this region are primarily noted for the production of white wines. Orujo gallego (a fiery spirit) is deservedly famous and is the primary ingredient in the Galician queimada (a traditional hot drink made with flamed orujo, sugar and lemon). Other typical liqueurs are made with coffee and herbs. Don't forget a multi-socket plug! If you are doing the Camino in summer; bring a travel sheet instead of a sleeping bag. A travel sheet is much lighter for your pack and if you get bed bugs, a sheet is much easier to wash and dry than a sleeping bag. Many pilgrims go to the pharmacy once they arrive in Spain and get a bed bug spray ( ZUM in Spain or bring one with you from home ) that you can spray on your bed at night. Bed bugs are very sensitive to heat so some hot water and a hot dryer should kill them. Make sure you bring earplugs! Do not forget. Even if you are lucky enough to be in a room with only a few people at least one person always snores. Just in case you have to answer a call of nature. It happened to me on my first Camino and I had to use some tree leaves. Once bitten, twice shy. One of those cool knives with a corkscrew. Wonderful for a sitdown in a meadow to enjoy some of the cheeses, cured meats and wines you'll find in most of the village shops. You'll see many people on the walk jotting down their thoughts in the long afternoons once settled in the albergue, had a shower, had a siesta and stretched out in the sun. You will experience so many situations, places and people that can be hard to remember later when you rejoin your comfort zone, so keep a record in any way you can!